The Catholic Church always taught that dogmatic formulas such as those of the Creed never change. It is why the Catholic Faith is always the same. However, first Modernism, and then the Progressivism of our days, said the opposite: Dogma should change following the evolution of language and History. Today we present Fr. Joseph Ratzinger, then a member of the International Theological Commission, reporting the conclusions of one of its studies. According to Ratzinger and the ITC, no dogmatic formula should remain the same. 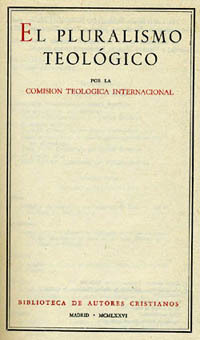 This book published the conclusions of the ITC in its meetings of October 5-11, 1972. Right, the frontpiece Theological Pluralism. 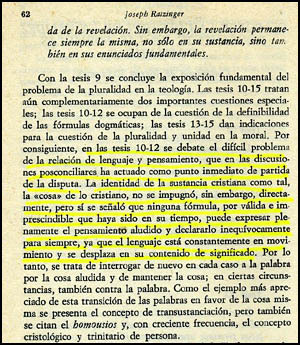 Below right, a photocopy of Ratzinger's report; below left, our translation of the Spanish text highlighted in yellow. The identity of the Christian substance as such, the Christian 'thing' was not directly ... censured, but it was pointed out that no formula, no matter how valid and indispensable it may have been in its time, can fully express the thought mentioned in it and declare it unequivocally forever, since language is constantly in movement and the content of its meaning changes.